I’m currently back to menu planning on a weekly basis. I don’t like it! It is a lot more work than doing a monthly plan, as odd as that may seem. I really need to sit down and menu plan the rest of this month and December; we’ll see when it happens. So, here’s our plan for the week. My slow cooker bit the dust this weekend after cooking the barbecue, so I’m not sure about the potato soup. I guess I’ll try the same recipe but cooking it in the stockpot on the stove. We’ll see how it turns out. Over the last 5 weeks our friends and my parents have been abundantly generous in providing food for my family. I feel overwhelmingly blessed by God’s provision! If you ever wonder if a meal you take to a new mom is appreciated, believe me, it is, more than can be expressed. It’s Monday after a nice four and a half day weekend in these parts, and that means we’re trying to get back in the groove. I’m also going to try to get back into the groove of posting on this here blog. I have several posts from the last few months that I need to get up for memory’s sake. Hopefully, I can get beyond this extended and unintentional bloggy break and back to posting regularly. For more menu ideas, visit orgjunkie.com. Happy Monday! Since Boo’s birthday in April, Little had told me that she wanted a rainbow cake for her birthday. I had it all planned out in my mind – ways to ensure all the layers of the cake turned out (unlike Boo’s), what icing to make, how to decorate it, what to serve it on. Then, the Saturday morning prior to her birthday she and I were out running an errand and on the way home she told me that she changed her mind, she wanted cupcakes instead. 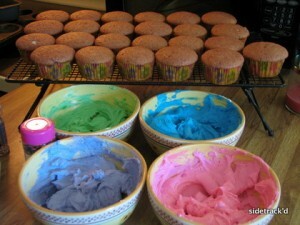 I kicked back into idea mode and began figuring out what kind of cupcakes we might make. 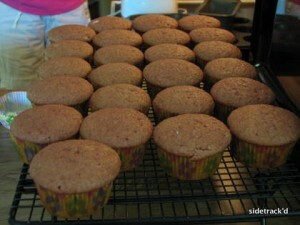 I considered borrowing the Wilton Big Cupcake cake pan, but Little really wanted individual cupcakes. Next, I thought of those pull-apart cakes where you use a shaped pan to make a variety of different cupcakes that make one “cake” (yeah, that description isn’t great, this is what I’m talking about). Finally I settled on just plain ol’ cupcakes. The next challenge was finding a strawberry cake recipe. I have a recipe from my grandmother that I really like, but it uses gelatin and boxed cake mix. Since we are trying to limit our processed food consumption I was trying to find a recipe that was truly a from-scratch recipe. Thanks to dear ole Google, I stumbled upon a recipe at A Dash of Sass and it was wonderful. 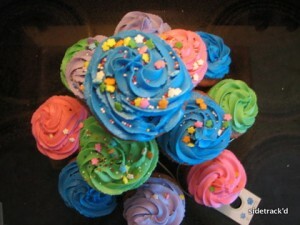 I used a large tip to pipe the icing on in swirls. (Funny story – the couplers I had were too small for my decorating tip. I had to forcefully hold the tip on the bag with one hand while piping the swirls. As long as I held it in place tight enough everything was fine, but if the tip slipped icing went everywhere) Then I placed the cupcakes on the stand. 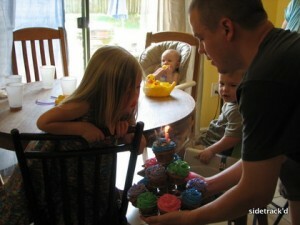 Matt added some sprinkles to the blue iced cupcake on top – per the birthday girl’s request. The candles were put in place and lit. 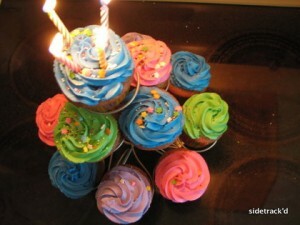 All that remained was the blowing out of the candles and the eating of the cupcakes. Based on the icing on faces and the rapid rate of cupcake depletion, I’m pretty sure they were a hit.